The term ‘Industry 4.0’ has been around for more than a few years, and it is likely that you have heard it, but maybe you still aren’t clear on its meaning. Or perhaps you have an idea of what it means, but aren’t sure exactly how it impacts your business. Here we have set out to define both what Industry 4.0 is, and why it matters to you and your business. 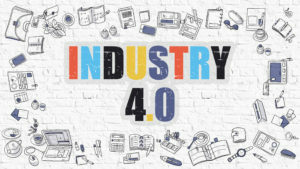 Industrie 4.0 began as a strategy to bring intelligence, connectivity, and computerization to traditional industries, most notably the manufacturing industry. The concept was first introduced at the Hanover Fair in 2011, and in 2013 the official plan and report came to fruition and were adopted by the German government. What began as a strategic initiative soon became a movement, spreading to the United States, Japan, China, and the United Kingdom. Since then, momentum surrounding Industry 4.0 has grown, with most major manufacturers adopting the necessary digital integration for this strategy. The following ideas are the key parts of Industry 4.0. The term “Smart Factories” includes manufacturers who have embraced these components. Digitization of Operations. Every part of your operation is digitally connected, allowing for machines, sensors, devices, and even people to communicate with each other. Systems and software seamlessly integrate, facilitating a transfer of information within all internal and external (suppliers, distribution centers, etc.) operations. Big Data and Analytics. This refers to the ability to process large amounts of data collected from connected devices in order to derive information essential to improving production. Plant models utilizing sensor data create a live depiction of factory operations, enabling real-time improvement decisions. Technical Assistance. Cyber-physical systems have the capability to assist workers with undesirable or unsafe tasks. These systems also help workers make more informed decisions while reducing human error. Decentralized Decisions: Cyber-physical systems monitor the physical processes of the factory and can make decisions independently. Are Industry 4.0 and the Internet of Things the same? No. The Internet of Things (IoT) is a component of Industry 4.0. In the simplest terms, IoT refers to a device’s ability to connect to the Internet (e.g. a smart watch or thermostat). IoT plays a role in Industry 4.0 with respect to “connected everything” within factory operations. Information gathered from sensors, machines and other devices is acquired via the IoT, and provides valuable data and insight into the manufacturing process. Cost savings. With greater overall efficiency and better technological integration, savings are accrued. Increased agility. Manufactures can better respond to rapid changes in products and technology. Better Product. Real-time data and Predictive Analytics provides real time control and maintenance leading to a higher quality product made more efficiently. Productive employees. Workers performance becomes faster and smarter leading to happier more productive employees. This results in both reduced training costs and lower turnover. It is clear that Industry 4.0 is the future of modern manufacturing. Large manufacturers have already begun to move in this direction, making necessary changes to adapt their processes to this new way of thinking. But those who hesitate will soon fall behind, giving first-movers a competitive advantage. Do you have a Strategy for Industry 4.0? We would love to talk help answer any questions you have about Industry 4.0 or how MMS can be a key part of your strategy.